I love these glasses! They are extremely well made and are pretty. The lenses provide more than adequate protection from the bright sun here in Florida. 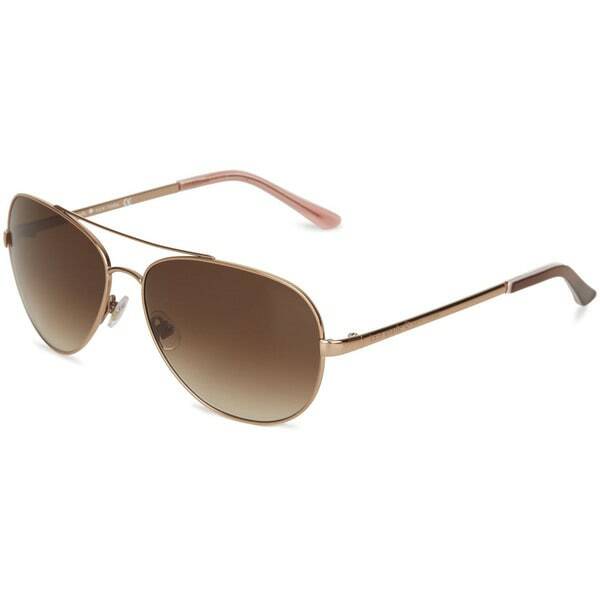 Kate Spade presents these rose goldtone aviator sunglasses with a touch of feminine flair. Brown gradient lenses provide full UV protection to your eyes and face. I purchased a pair of these Kate Spade aviators last year and had so many compliments, that I immediately purchased my niece a pair for her birthday last year. And now I just purchased this pair for my sister for Christmas. I know they will love them as much as I did! I bought these glasses because they were advertised as rose gold in color. They are not. They are just gold. Very disappointed. I would return them but am not willing to waste more money on shipping charges. Lens was popped out Of one side when I opened package for the first time. I will return If It pops Out again. Extra mailing care needed inside glass case. Attractive glasses. Hope the lens will not Fall out again. If it does I will return to Overstock. Love these sunglasses. They fit well and look really good on. I love Kate spade her stuff is always made well. These sunglasses are gorgeous! They fit perfectly and are high quality! Love them!! Hope they come in other colors. I'm hooked! Also, the fit is perfect! So pleased with this purchase, I love these sunglasses! They look just like the photo & as described! They have a great feel to them, and are a perfect size and shape for my face. I am a HUGE fan of Kate Spade ♠️ designs and very excellent quality. However, unfortunately the shades on the glasses were NOT a dark enough tint. The price for designer glasses was very good and my Tom Ford aviators are falling apart. I’ve ever tried on a pair of Kate Spade sunglasses and they look awesome so I’m going to give them a try!